Climate, Elevation: From the coast inland to southwest Alberta, Montana, Idaho and eastern Oregon. Local occurrence: Coniferous forests, especially moist areas, from low elevations to the montane (300 m to 1900 m). 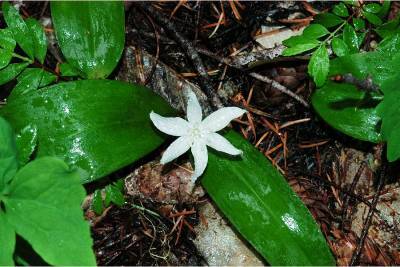 Clintonia is a classic shade species of Pacific Northwest forests. In very dark forests, there appears to be little sexual reproduction. Conditions in older forests are better (whether this is related to increased light, soil development, protection by a thin shrub layer, or increased below ground storage is not known, but it is probably a combination of factors). Under good conditions, a high proportion of Clintonia flower and set seed. Associated species: Maianthemum diletatum, Trillium ovatum, Achlys triphylla. The plant is highly shade tolerant. It is found in closed canopy coniferous forests, and can be vigorous in old-growth stands. Plants flower between May and June, with fruits maturing from late July to September. Data on seed germination is sparse, but suggest that one full year between ripening and germination can be required, although three months of cold stratification can be sufficient. There is no information about seed production or fertility. Plant ramets usually have one fruit or none. The fruits contain multiple seeds. Sow seeds in flats in the fall after collection. Otherwise, stratify for 2-3 months. Keep soil moist. Rhizomes are long and fast growing. Plants taken from salvage areas can yield rhizomes that can be grown individually. Plant rhizomes in moist, well drained soil. Mature plants can stand some drought, but keep young plants moist. Plants can tolerate full shade, but do well in dappled sunlight. The plant can live over 30 years, and spreads by rhizomes. Natural reproduction appears to be dominantly by rhizome rather than by seed. Meyer, Rachelle S. 2005. Clintonia uniflora. In: Fire Effects Information System, [Online]. U.S. Department of Agriculture, Forest Service, Rocky Mountain Research Station, Fire Sciences Laboratory (Producer). Available: http://www.fs.fed.us/database/feis/ [ 2006, April 3].